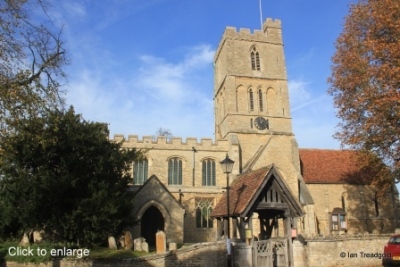 The church of St Mary in Felmersham is situated on the north side of the village near to the River Great Ouse. 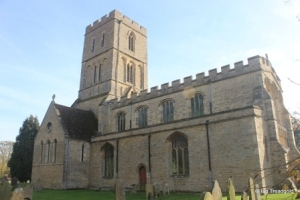 Limited parking is available outside the church in Church End. The church is one of the finest in Bedfordshire with the west front especially worthy of note. 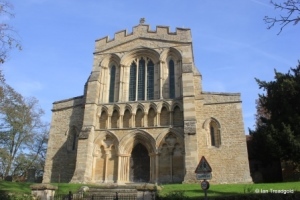 The church consists of a nave and chancel with two aisles, a central tower and crossing with transepts to the north and south. 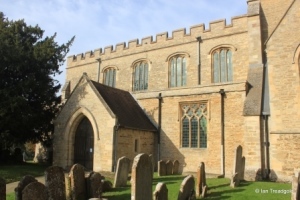 Originally dating from the Early English period the present church was built between 1220 and 1240 by the monks of Lenton Priory, a Cluniac monastic order within the modern boundaries of Nottingham. 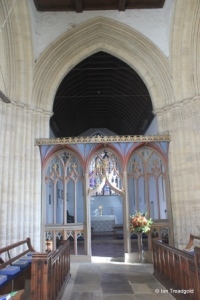 The chancel is around 42 feet by 17 and 39 feet high. The nave is 60 feet long by 21 feet and about 29 feet high with the two aisles adding 8 feet each to the width. 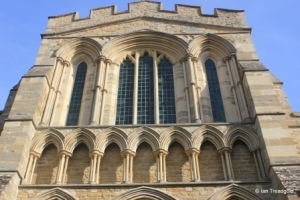 The south transept is quite small extending to the south only to the depth of the south aisle. 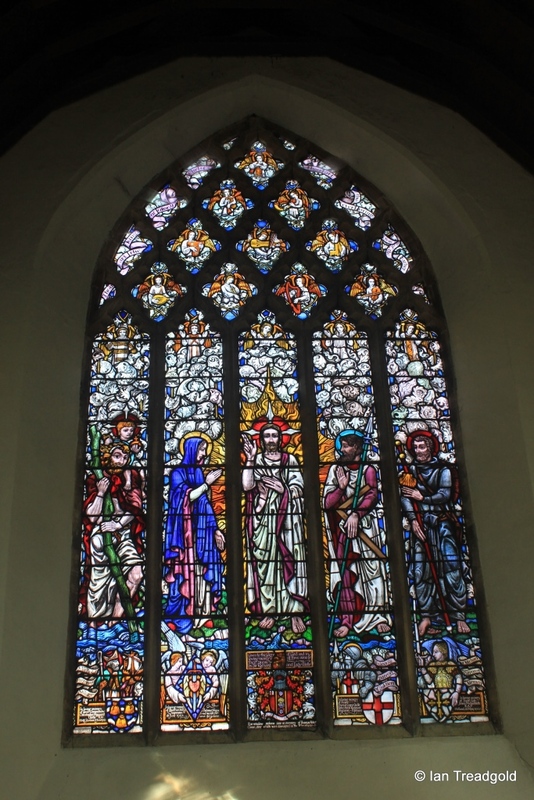 It has a single lancet window at the east end of the Memorial Chapel containing the millennium window depicting images of the Incarnation. In the chapel is a piscina on the south wall of the transept. 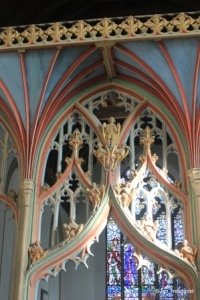 The south window of the transept is of two tall lancets with a vesica above in the plate tracery under a two centred arch. 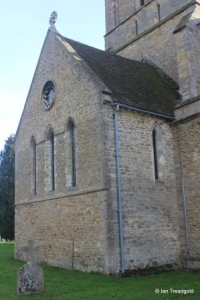 The south aisle itself has two windows on either side of the porch. Both are of three trefoiled lights with quatrefoil tracery above under square heads. 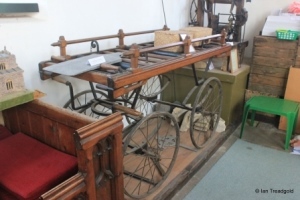 Inside there is a Victorian folding oak funeral bier used to transport local coffins for burial. 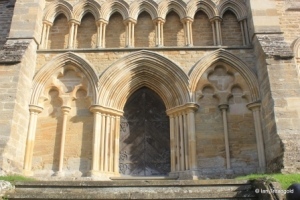 The south porch was rebuilt and enlarged in restoration work in 1828 and has small single lancet windows to the east and west. 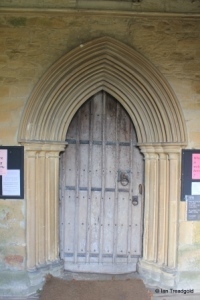 The doorway has deep mouldings and clustered shafts with bell capitals. 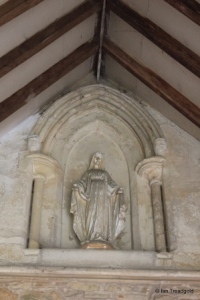 Above the door in the porch is a niche with mouldings and shafts currently occupied by a statue of the church’s patron saint. 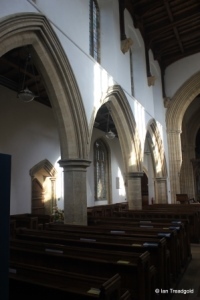 The clerestory above has four windows on each side, each of three cinquefoiled lights under flattened four-centre arches with hood-moulds and corbels. The clerestory, west end and tower are all embattled. 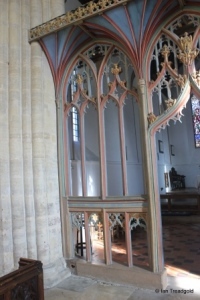 The west ends of the two aisles have identical windows, each being a single lancet under a pointed head with colonettes supporting the arches. 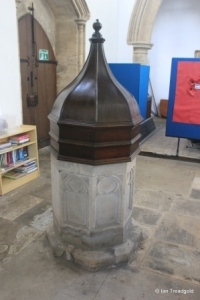 At the west end of the south aisle stands the octagonal font with a domed cover. 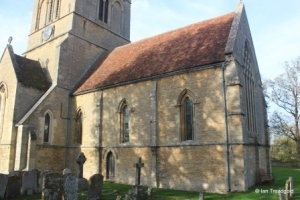 The imposing west end of the church is on three levels. At the ground level the central west door has deep bands of moulding rising from clustered shafts. 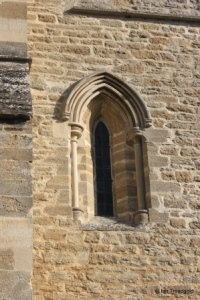 Flanking are two identical moulded arches filled with blind trefoil tracery with a quatrefoil design above. The middle level has a wall arcade of seven bays with moulded arches with ornamentation in the inner order that varies across the arcade. Each arch springs from four capitals on top of slender round shafts which are clear of the wall itself. 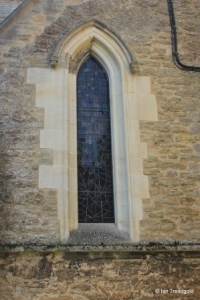 The upper level has two single lancet windows in pointed arches framing the central west window. 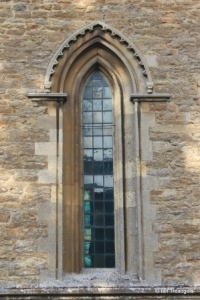 The central window has three lights under a four-centred arch. The outer lights have cinquefoil designs whilst the central light is trefoiled. 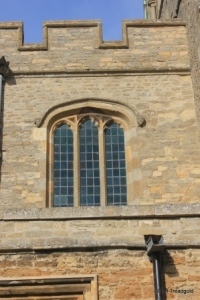 The three upper windows are linked with shared shafts forming the arches. 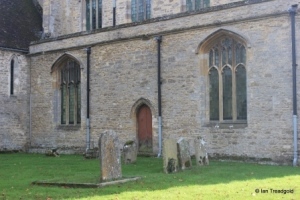 The north aisle has two windows surrounding the north door. 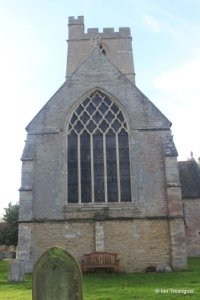 The two windows are the same with three cinquefoiled lights with perpendicular tracery under four centred arches. 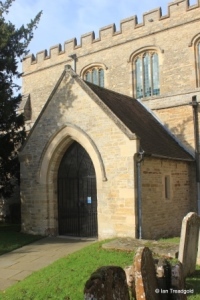 The simple north door is under a two centred arch. 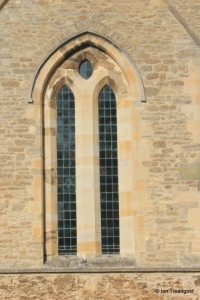 The north transept has single lancet windows to the west and east. On the north side there are three single lancets under a shared hood-mould. 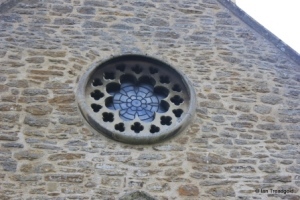 Above is a round window with a multifoil design surrounded by alternating trefoils and quatrefoils. 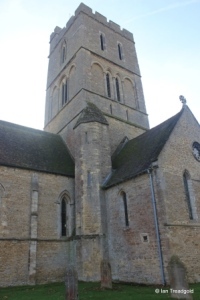 In the angle between the transept and the chancel is a stair turret leading via an internal door to the tower above. 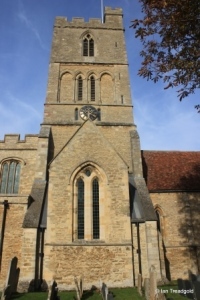 The tower is of three stages above the roofs. The lower stage has two lancet windows on the north, west and south sides. The middle stage varies with the east and west faces having an arcade of three bays. The outer bays being blind with a round arch in the middle containing two lancets. On the north and south sides these centre bays are replaced with two distinct lancets under pointed heads. In all cases the jambs are formed of shafts. Above this middle stage is a small corbel table on what used to be the top of the tower until C15 when the upper level was added. The upper level has single openings of two trefoiled lights under a pointed arch on the east, south and west sides. On the north, there are two separate lancet openings under ogee heads. 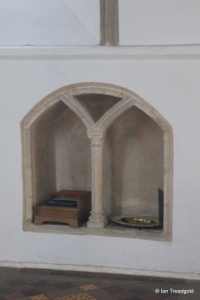 There is a further corbel table below the embattled parapet. 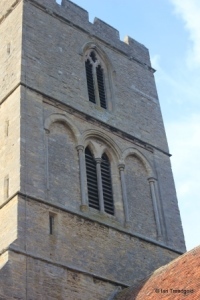 There is a square stair turret in the south-east corner and a clock face on the south side of the tower. 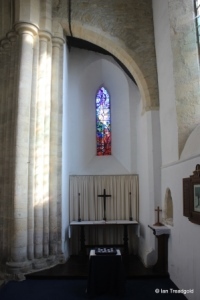 The chancel has three lancet windows on each side under pointed arches with a string course around all sides. 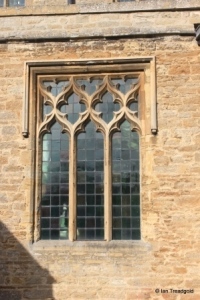 The three north facing windows are plain whilst those to the south have dog tooth ornamentation in the hood-mould. 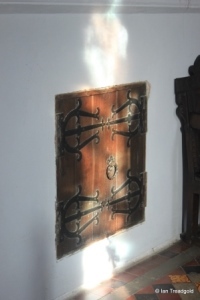 The south side priest’s door also has the dogtooth decoration in its hood-mould. 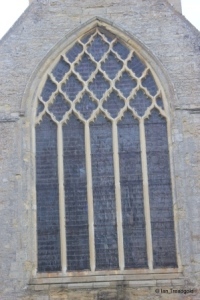 The east window is of five lights under a two-centred arch with extensive net tracery using enriched quatrefoil designs. 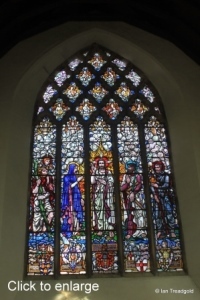 The window was commissioned in 1951 by Sir Richard and Lady Wells in memory of their three sons, who fell in the Second World War along their nurse. The design consists of a central figure of Christ, flanked by St Christoper, St Mary to the left and St George and St James to the right. These saints are the patrons to sailors, this church, soldiers and airmen respectively. 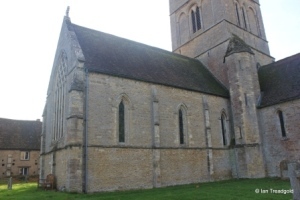 The east end of the church has clasping buttresses at the corners. 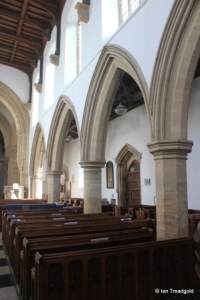 Inside, the nave is of four bays with the columns alternating between round and octagonal on opposite sides. The oak rood screen is undated but its style indicates C15 work and is fortunate to have survived the Puritan purges of C17. The inscription across the middle translates as “Pray for the souls of Richard Kynge and his wife Annette builders of this work”. 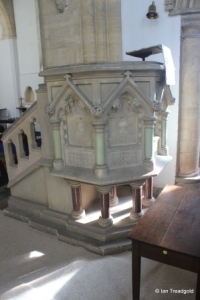 The over large pulpit dates from restorations in 1895. 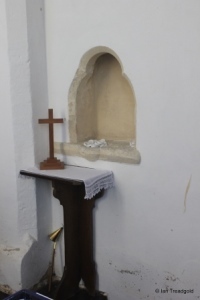 To the sides of the altar are an aumbry to store consecrated bread and on the south side a double piscina with a central pillar. The roof corbels depicting the four Evangelists, Mathew (represented by an Angel), Mark (a winged lion), Luke (a winged ox) and John (an eagle) are in the four corners of the roof. 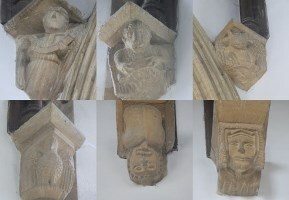 The other corbels probably depict local people when the church was built and include a figure with his head between his legs sticking his tongue out. Page last changed 11/11/2014. Reformatted 16/02/2016.